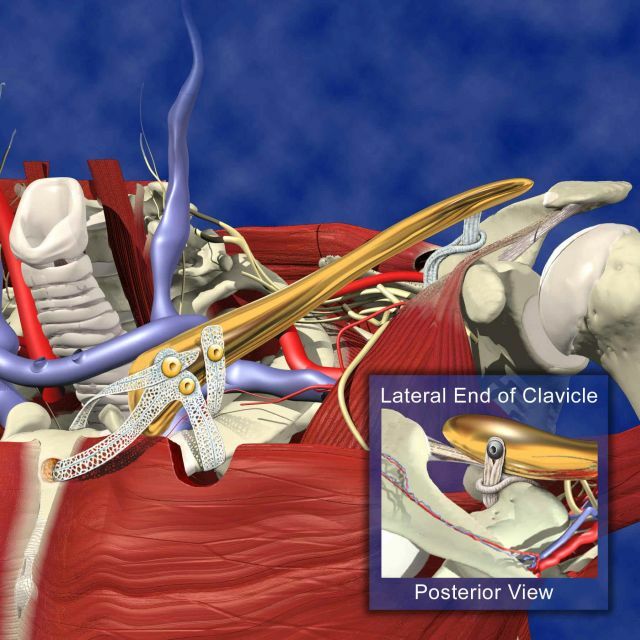 The world's first claviculoplasty was performed in May 2003. The work to develop the implants used was a collaboration between Ellis Developments, Pearsalls, Biomet and Surgicraft. The surgeon was Prof. W Angus Wallace at Nottingham City Hospital. This page tells of the contribution of all those involved. 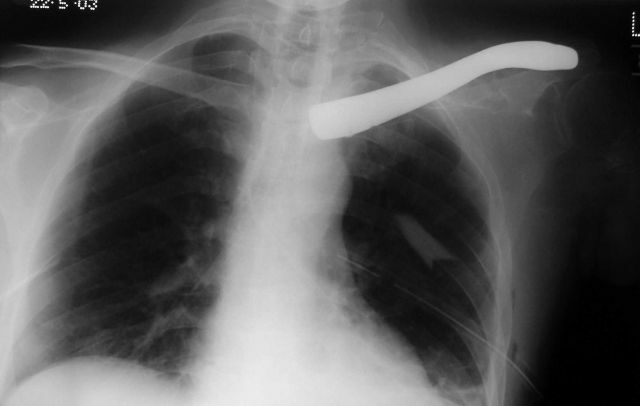 Before the operation the right hand side clavicle can be clearly seen on this x-ray, and below that the post-operative x-ray clearly shows the titanium implant. The following picture demonstrates how the implant was attached with artificial textile ligaments, the one on the outer end made by Surgicraft and the inner (medial) end custom designed by Ellis Developments and manufactured by Pearsalls. In the development of endoprostheses, anatomical data plays an important role for the design and dimensioning of the implant. As Tim’s left clavicle had been previously excised it was planned to use the CT scan data from his right clavicle. This data was converted and transferred into a CAD system, where it was mirror imaged to produce the geometry of the proposed left clavicle. This geometry was then utilised to produce a CAD model of the clavicle. At the Sterno-Clavicular end of the clavicle three spherical seated screws were positioned to allow the Sterno-Clavicular ligament to be attached. On the lateral posterior aspect of the clavicle, a small clamp plate and screw were positioned to allow the Acromio-Clavicular ligament to be attached. With the design finalised the CAD model was then positioned into its anatomical position within the scan reconstruction, to check alignment and fit. Titanium alloy was chosen for the implant, with a titanium nitride coating to improve wear resistance and help prevent tissue staining. All Biomet Merck implants are manufactured from proven materials and are fully content traceable and meet all relevant British, European and American standards. Working closely with the engineers from Ellis Developments the design was finalised, and a wax model of the proposed clavicle prosthesis was sent to Professor Wallace for his approval. CNC machining programs were written, and the clavicle was manufactured using highly skilled personnel and programmable computer- controlled machining centres, capable of producing implants to the finest tolerances. Based in the West Midlands, Surgicraft was founded in 1924 and has a long and successful history of launching leading-edge medical devices. Surgicraft has developed a range of products across all of its main business areas, including the development and launch of the Surgilig in conjunction with Professor Angus Wallace and Mr Lars Neumann of the Nottingham Shoulder and Elbow Unit. The company also has a number of other products which are currently being launched in the UK and world-wide markets. 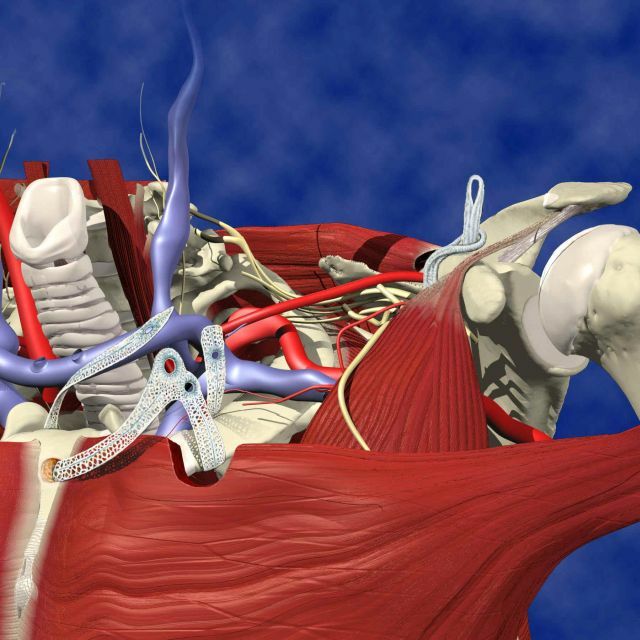 The Surgilig is a purpose-made artificial ligament designed to stabilise the collar bone following a severe dislocation. It secures the collar bone in place and is fixed with a stainless steel bone screw. Surgilig utilises Surgicraft’s proprietary material technology to provide a strong biocompatible fixation that develops good tissue in-growth. It has been used nation-wide for the last three years in both NHS and private hospitals.The company has a considerable track record of developing innovative, leading-edge products for a number of diverse healthcare sectors and is currently finalising a private equity fundraising project to support the launch of its latest innovative shoulder product across Europe and other key export markets. This new technology was devised by Ellis Developments Limited and developed further through a collaboration between Ellis Developments and Pearsalls Limited. Ellis Developments Limited is a Nottingham textile company which specialises in the design and development of textiles for engineering applications, as well as surgical implants. Pearsalls is a very long-established Somerset company which manufactures suture thread as well as designing and manufacturing surgical implants made from suture threads. 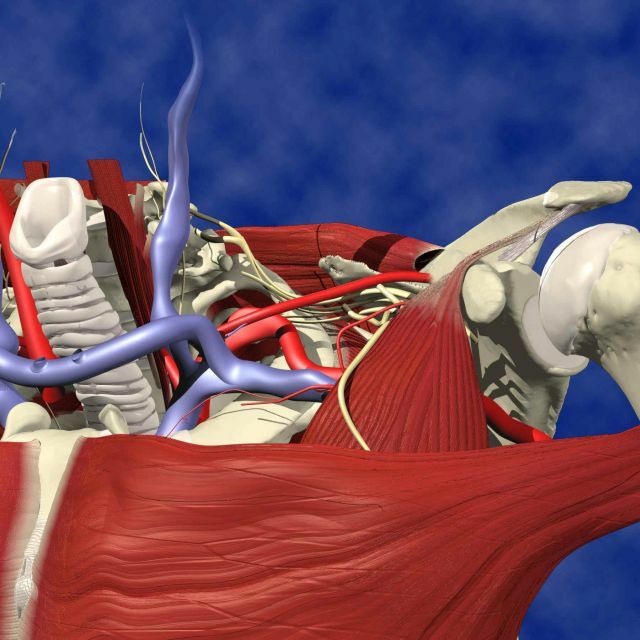 The two companies have collaborated with Professor Wallace at Nottingham to produce repair systems for shoulders, and with Professor Brian Hopkinson at Nottingham to develop an artery liner to treat abdominal aortic aneurysms using keyhole surgery. 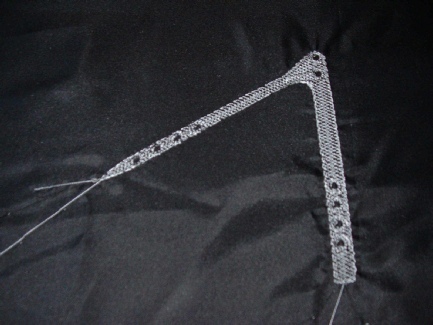 The technology to make the implant is a development from commercial embroidery techniques. The design is drawn up in Nottingham on a standard drawing package on the computer, the design transferred to a commercial embroidery design software package and the computer-based design programme prepared. The design is then e-mailed to Pearsalls in Somerset, where manufacturing can start, if necessary, within minutes. The embroidery is carried out in a clean room using suture thread on a soluble cloth. Superimposed layers in the design ensure that the implant is strong and stable when the cloth is dissolved. The implant is sent for sterilisation by gamma irradiation and then despatched to the surgeon. Professor W Angus Wallace was appointed Professor of Orthopaedic and Accident Surgery at the University of Nottingham in 1985. He is Consultant Orthopaedic Surgeon to Nottingham City Hospital and the Queen's Medical Centre and also Honorary Consultant to the Portland Training College for the Disabled in Nottinghamshire. He has particular interests in shoulder and elbow surgery, biomechanics and passenger safety in transport accidents, sports medicine, medical informatics, osteoporosis and new methods of providing healthcare within the NHS. His shoulder and elbow interests were highlighted when the Nottingham Shoulder and Elbow Unit was launched in August 1992. This is now one of the largest Shoulder and Elbow Units in the country and Prof. Wallace works alongside consultant colleagues Mr Lars Neumann and Mr Paul Triffitt. Professor Wallace holds many senior positions in shoulder and elbow surgery and biomechanics in the UK and worldwide, including President of the British Elbow and Shoulder Society and Co-Chair of the Research and Training Advisory Group, Medical Devices Faraday Partnership. He has received awards and prizes for his achievements in medicine and is a prolific writer and lecturer on orthopaedics.